It’s what they say in prisons when a man on death row is taken from his cell. It’s what Twitter yelled when Dan Bylsma walked to the mic for his presser Sunday. Disco Dan, winner of a Stanley Cup, winner of the Jack Adams award, has fallen out of favor with the rabid Penguins’ fans. He was blamed for last season’s embarrassing playoff crumble, North Korea having nuclear weapons and for the Pens finishing in 4th place this season. I wouldn't be surprised to find out he shot Kennedy (the president, not TK. He loves TK). 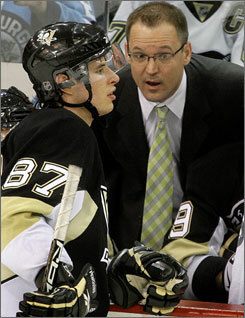 As late as March of this season, Bylsma was beloved. The Pens, after all, owned March. However, there’s something about being swept in the Eastern Conference finals that has a way of erasing all that. Instead of looking at Bylsma and saying the Pens have made the playoffs every year since he has been skipper of the ship, people are upset because they haven’t won the cup since 09. Expectations are high in Pittsburgh.To me it seems a bit of a knee-jerk reaction to fire Bylsma, but something is going to change as sure as the past seasons have been disappointments. If Lemieux wants it, it likely won't matter what Ray Shero would have to say. The Pens went all-in at the trade deadline making a clear statement that they meant to win the Cup. After suffering the devastating blow and uncertain future of Sidney Crosby following his fractured jaw, Shero picked up Jussi Jokinin as a bandage for the disaster. Then, in rapid succession, Jarome Iginla, Brendan Morrow and Douglas Murray were added. Suddenly Penguin fans were giddy with anticipation of hoisting the cup. 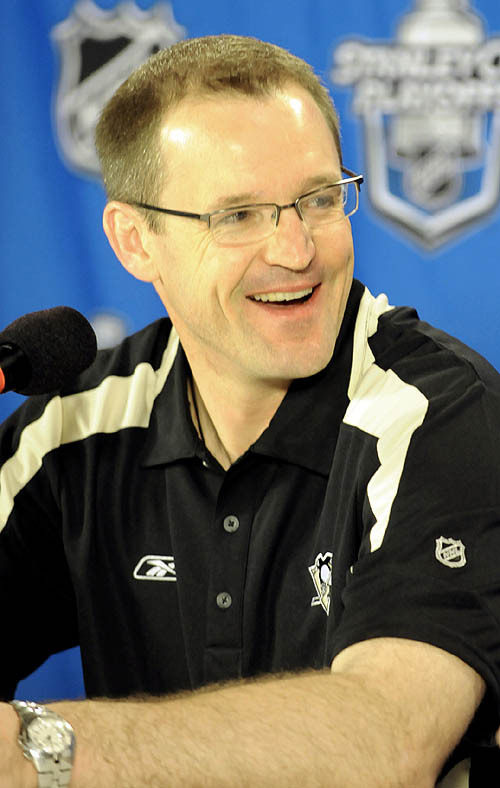 Bylsma was asked at press conferences what it was like to have such talent at his disposal. He smiled a toothy smile. Then, came the playoffs. Bylsma shuffled his lines like a blackjack dealer in Vegas. Instead of concentrating on the top 6 forwards and using them at their most effective positions, he seemed to think it would win the game if Kennedy was in instead of Vitale. Was it an Eaton kind of night or Engelland? The tragedy in all of that shuffling was undervaluing Iginla. He needed a place to call his own, a place like Sid’s right wing. The Boston series saw the powerplay that once was ranked with the top units in the League become as effective as deodorant in 100 degree weather; after a while it all smelled. The defense? It was brilliant at times. It was disappointing at times. It was mostly frustrating. They collapsed. Rife with talent, the Penguins collapsed. The criticism is that Bylsma failed to adapt to the Bruins as evidenced by the sweep, never holding the lead, being shut out on the powerplay and scoring only 2 (T-W-O) goals in the series. Zero goals were scored by Sidney Crosby. Zero goals were scored by Evgeni Malkin. Bylsma is to blame, of course. Malkin lost composure throughout the playoffs and took stupid penalties that led to too many minutes in the sin bin. Should Bylsma have sat Malkin to tame his temper? Probably. It’s all his fault. Keep in mind, however, that Bylsma has one year left on his contract with the Pens. The above mentioned rumor of Mario demanding he be fired is suspect at best. Why would Lemieux play his cards so close to the vest only to leak something like that to the NY media? Since you can’t fire the team, the only reason to let the coach go would be for the front office to try to save face. 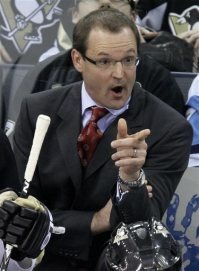 I think Bylsma will stay. I think he may need to tighten the reigns of his superstars but I think it’s a bit silly to fire a coach who consistently brings winning seasons and gets teams to the playoffs. I would be in favor of shoring up his assistants, maybe finding a genius defensive coach or how about a goalie coach? Fire Bylsma over a four game sweep? 26 teams finished behind them. I don’t see it.